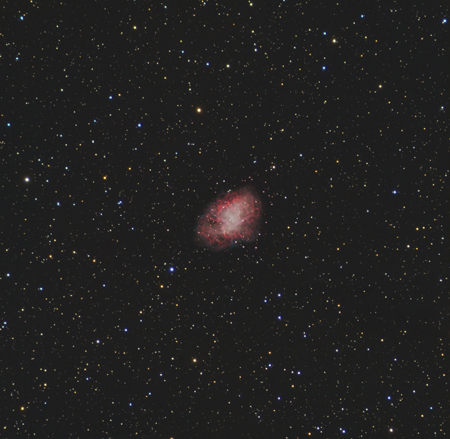 The Crab nebula is the remains of a supernova explosion, the light of which reached the Earth in 1054 and was recorded by Arab, Chinese and Japanese astronomers at the time. 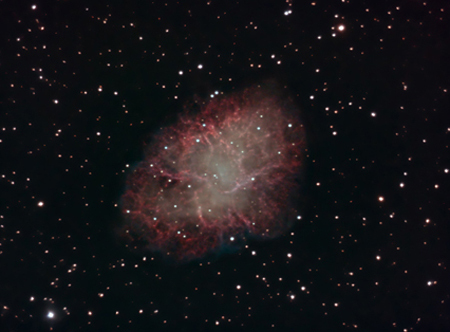 The remnant was discovered by John Bevis in 1731, and rediscovered independently in 1758 by Charles Messier and was designated M1 by him, it being the first on his list of objects that werent comets. Its 6,500 light years away and is 11 light years across. 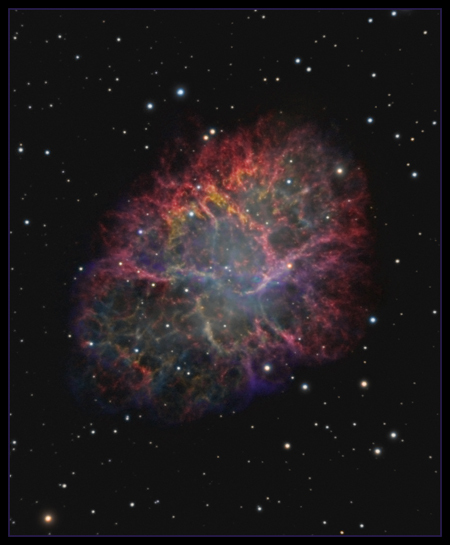 The central pulsar is about 19 miles in diameter and is spinning at 30.2 times per second.It's in the constellation of Taurus and is visible as a faint grey blob in a small telescope. 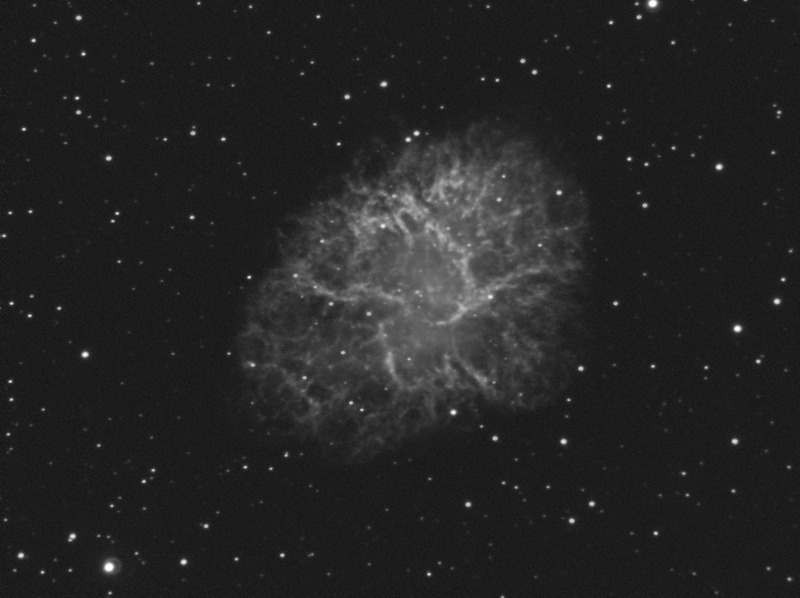 It's one of the first objects I imaged, and spent a week learning from the web and trying to stack images and come to grips with LRGB processing. Scroll down the page to see earlier images I've taken of this object, including my very forst one. 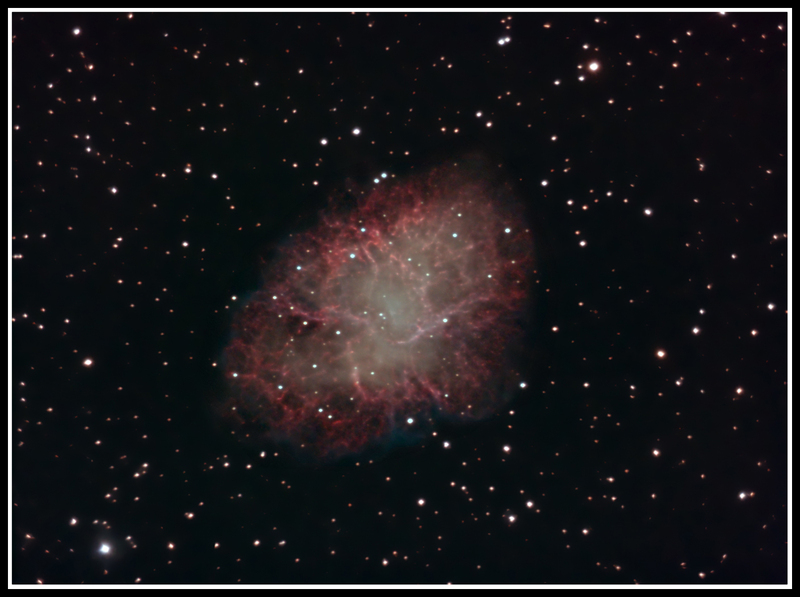 This is comprised of narrowband data using Hydrogen alpha, Sulphur 2 and Oxygen III filters for the nebula with some RGB star colour added from a previous image. 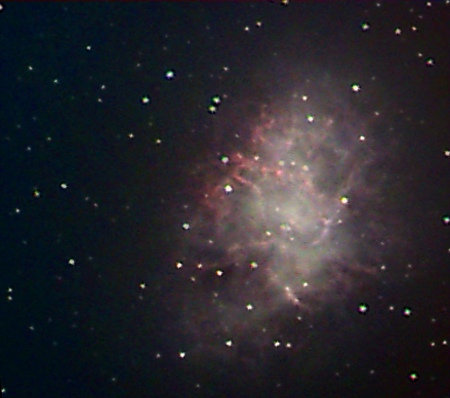 I didnt go for the standard Hubble palette colour mapping for this. Instead, I mapped Ha to red, S2 to green and OIII to blue. Imaged in November 2011 from Dorset. Telescope. Celestron 11 inch Edge HD and AP 0.67x focal reducer. All subs were 6 minutes unbinned. Ha x 35, S2 x 21, OIII x 21. Total imaging time. 7 hrs 42 minutes. Images 2 & 3 are my latest images of the Crab. Image 3 is a crop of the first image. They use data from the third image, done between December 2007 & February 2008, and September 2009 for the core, combined with data obtained in September 2009 for the starfield. This was registerd to match using Registar, and then combined in Photoshop. The RGB starfield data was obtained at the same time as the Luminance data, using 2 telescopes and 2 cameras on the same mount. 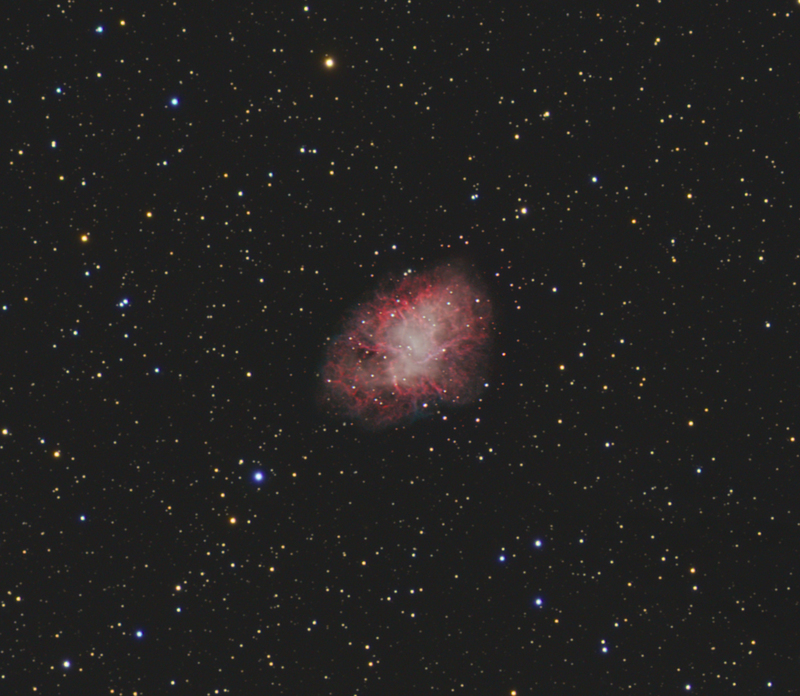 Luminance was captured using a TMB 152 @ F8 and Starlight Xpress SXVF H16, and RGB was captured using a William Optics ZS80FD @ F6.9, and Atik 16HR. This image was made up od data gathered in 3 sessions. The first session was on December 10th 2007....16 x 4 minutes of Ha data with the Atik 16HR @ F6.3 ON the 14 inch. This image is the H-Alpha from December 2007, and was used as luminance in the image above. 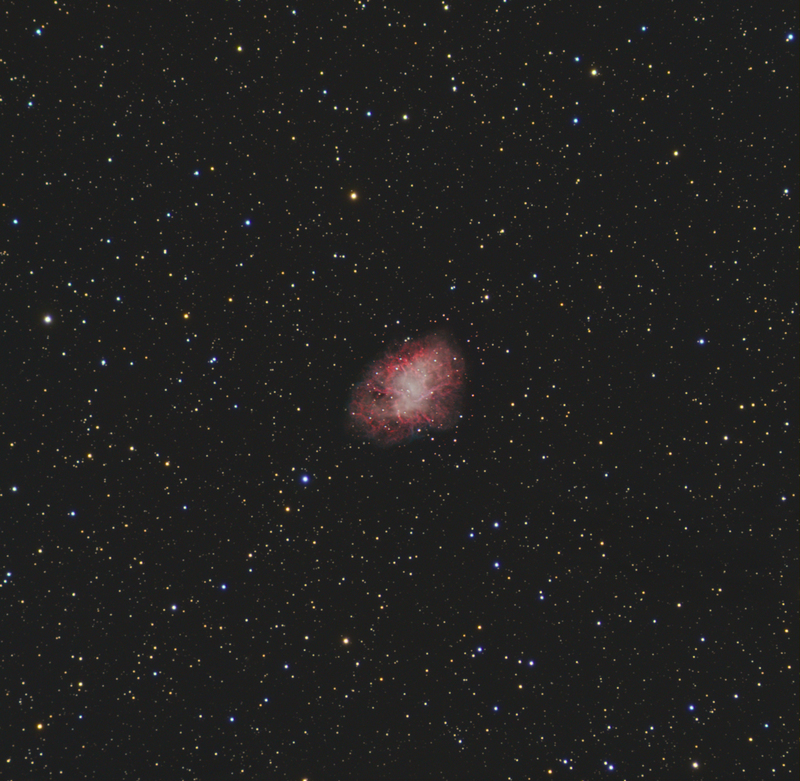 This image is my first attempt at the Crab, and also my very first LRGB image. 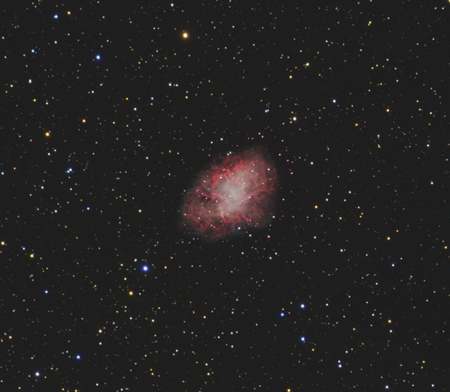 Imaged with a Meade DSI pro and a 10 inch Meade LX200 Classic on an alt/az mount in December 2006. 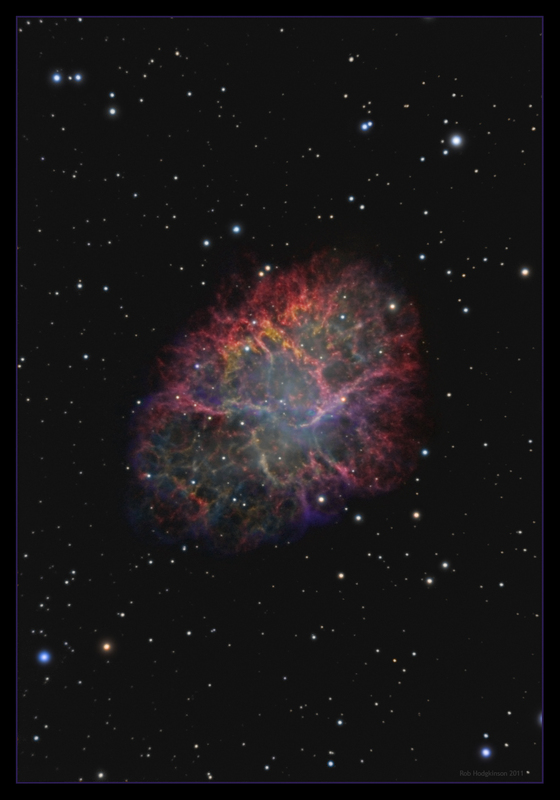 This is made up of 21 second exposures, 45 x luminance and I forget how many for RGB!.